Objective Liver function test (LFT) elevations are reported with the use of tumour necrosis factor inhibitors (TNF-Is). The aim of this study was to compare LFT elevations in patients with rheumatoid arthritis receiving adalimumab (ADA), etanercept (ETN) or infliximab (INF) enrolled in the Consortium of Rheumatology Researchers of North America from October 2001 to March 2007. Methods Alanine aminotransferase (ALT) and/or aspartate aminotransferase (AST) levels >1× upper limit of normal (ULN) were considered elevations and ALT/AST levels >2× ULN were considered abnormalities. Treatments included TNF-Is, methotrexate (MTX), leflunomide and other disease-modifying antirheumatic agents (DMARDs). Patients were censored after their first LFT elevation. Three analytical models were evaluated: (1) individual TNF-I vs non-biological DMARDs (primary model); (2) individual TNF-I plus MTX vs MTX monotherapy; and (3) limited to new users of individual TNF-I vs non-biological DMARDs. ORs for LFT elevations were estimated using generalised estimating equation logistic regression. Results 6861 patients (ADA: 849; ETN: 1383; INF: 1449) with 22 522 determinations were analysed. LFT elevations >1× ULN with TNF-I use were seen in 5.9% of AST/ALT determinations and abnormalities >2× ULN in 0.77%. In the primary model the adjusted ORs for LFT elevations >1× ULN were ADA 1.35 (95% CI 1.09 to 1.66), ETN 1.00 (95% CI 0.83 to 1.21) and INF 1.58 (95% CI 1.35 to 1.86). For 2× ULN, adjusted ORs were ADA 1.72 (95% CI 0.99 to 3.01), ETN 1.10 (95% CI 0.64 to 1.88) and INF 2.40 (95% CI 1.53 to 3.76). Similar results were obtained in other models. Conclusion The overall incidence of LFT elevations >1× ULN with TNF-I use was uncommon and abnormalities >2× ULN were rarely observed. Significant differences were most consistently observed with INF, less commonly with ADA and were not observed with ETN compared with comparator DMARDs. Postmarketing observational studies of DMARDs have contributed to our understanding of the hepatic risk of non-biological DMARDs.4 9 16 17 Moreover, observational studies have shown that regular monitoring of AST/ALT can avoid potential hepatotoxicity for MTX and LEF.16 18 Postmarketing reports of serious hepatic adverse events have rarely been reported with TNF-I use,8 19 20 and epidemiological studies of the association of TNF-I use and liver function test (LFT) elevations have not been published. Moreover, recommendations regarding LFT monitoring are not consistent across approved TNF-I agents.8 19 20 This analysis of 6861 patients with RA over 22 522 visits was conducted to evaluate the risk of ALT and/or AST of individual TNF-I agents versus comparator non-biological DMARDs. Analyses were conducted in all patients with RA enrolled from October 2001 to March 2007 in the Consortium of Rheumatology Researchers of North America (CORRONA) registry, a prospective longitudinal cohort with physician-diagnosed RA or psoriatic arthritis treated at 65 sites composed of 47 community (72%) and 18 academic (28%) practices across the USA.21 Included in the analyses were patients receiving TNF-I and/or all non-biological DMARDs with normal baseline ALT and/or AST values, including MTX and/or LEF, with available follow-up determinations. Patients with psoriatic arthritis were excluded to enhance uniformity. Those with exposure to biological agents other than TNF-Is (eg, rituximab, abatacept) were excluded from analyses and all visits were censored once either agent was initiated. In total, 6861 consecutively enrolled RA patients with 22 522 visits were analysed. Drug categories included individual TNF-I agents, MTX, LEF and all other non-biological DMARDs as a group (sulfasalazine, hydroxychloroquine, azathioprine, gold, penicillamine). The primary model (model 1) examined AST/ALT in prevalent users of individual TNF-I agents versus non-biological DMARDs. Model 2 also examined AST/ALT in prevalent users of TNF-I agents but was limited to those using combination TNF-I plus MTX versus MTX monotherapy. Model 3 was limited to new drug initiations of TNF-I agents versus non-biological DMARDs. ALT and AST determinations were performed locally at each CORRONA site and collected, with serum albumin, at visits every 3 months. Only those measures acquired within 1 week before or after a CORRONA scheduled visit were recorded. Total bilirubin and alkaline phosphatase values were not routinely collected in CORRONA data as they have previously been shown not to be affected by MTX.23 ULN values for ALT and AST were based on reference norms obtained from Quest Diagnostics, widely used as a central laboratory in multinational randomised clinical trial (personal communication, Quest Diagnostics physician representative, July 2007). These values were as follows: ALT ULN: men 60 IU/l, women 40 IU/l; AST ULN: men 50 IU/l, women 35 IU/l. To assure measurements were not biased by site, average values were evaluated with a scatter plot revealing excellent association around the overall mean and interquartile means evaluated by site were consistently overlapping in their ranges (see figures 1 and 2 in online supplement). Values for AST are shown, values for ALT were similar. Adjusted odds ratios (ORs) for alanine aminotransferase (ALT) and/or aspartate aminotransferase (AST) >1× upper limit of normal: main effects model. Results listed as OR with 95% CI. Reference group is patients on other non-biological disease-modifying antirheumatic agents (DMARDs). Cohort 1: prevalent tumour necrosis factor inhibitor (TNF-I) users and on methotrexate (MTX), leflunomide and other non-biological DMARDs. Cohort 2: prevalent TNF-I users only receiving MTX. Cohort 3: initiating TNF-Is. Adjusted odds ratios (ORs) for alanine aminotransferase (ALT) and/or aspartate aminotransferase (AST) >2× upper limit of normal: main effects model. Results listed as OR with 95% CI. Reference group is patients on other non-biological disease-modifying antirheumatic agents (DMARDs). Cohort 1: prevalent tumour necrosis factor inhibitor (TNF-I) users and on methotrexate (MTX), leflunomide and other non-biological DMARDs. Cohort 2: prevalent TNF-I users only receiving MTX. Cohort 3: initiating TNF-Is. Comparisons of clinical and demographic characteristics across treatment groups used descriptive statistics, shown in table 1. ORs and 95% CIs comparing the risk of ALT/AST elevations and medication exposures were estimated using generalised estimating equation and logistic regression models; visits were nested within patients with potentially multiple visits per patient. 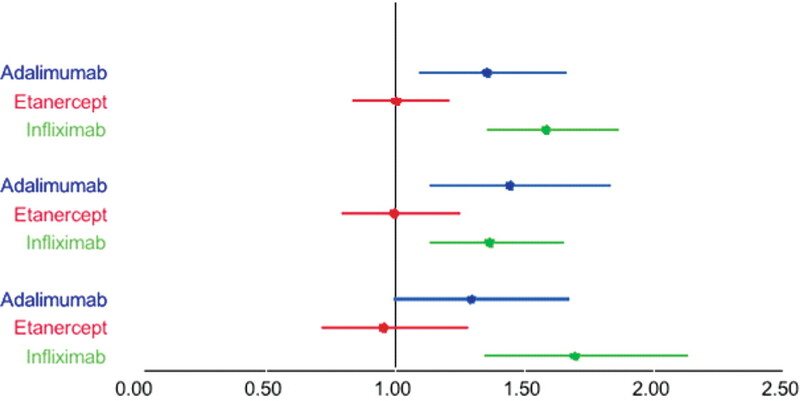 Covariates in univariate analyses comprised 37 variables (table 1); those significantly associated (univariate p<0.05) with drug exposure or outcomes were included in multivariate analyses. Rates of events per visit and per person were calculated for each of the treatment groups. All analyses used Stata Version 9. To better understand whether the risk for ALT and/or AST elevations/abnormalities associated with TNF-Is varied by background DMARD use, sensitivity analyses were conducted. An interaction model compared outcomes with patients receiving MTX monotherapy. Another model used a person-time analysis to assess the incidence rate ratios (IRRs) and persistence of elevations at subsequent visits, including whether the prescribed TNF-I and/or background DMARDs were discontinued at subsequent visits. Table 1 shows selected demographic and disease characteristics of the 6861 patients with RA included in these analyses. At baseline, 74% were women, 73% were positive for rheumatoid factor, their mean age was 59 years, with a mean disease duration of 10.6 years and 2.8% had a history of liver disease. The mean follow-up per person was 17 months with a mean of 3.1–3.4 visits per year and approximately 2.7 ALT and/or AST determinations per year. The number of events, study visits and event rate per visit are shown in tables 2 and 3. Rates of ALT/AST elevations >1× ULN when using TNF-Is overall were 5.4%; with adalimumab (ADA) it was 6.4%, with etanercept (ETN) 4.8% and with infliximab (INF) 6.7%. Evaluation of visits during which patients were on any TNF-I but without any background DMARD showed similar rates of transaminase elevation (>1× ULN) per visit at 5.8% (119/2041). Abnormalities >2× ULN were seen overall in 0.6% of patients. These abnormalities were found in 0.9% of those receiving ADA, 0.6% of those receiving ETN and 0.9% of patients receiving INF. The overall number of elevations ≥3× ULN or ≥5× ULN (0.1% and 0.04%, respectively) were too small for further analysis. A per-person analysis of cumulative IRRs of LFT elevations in TNF-I users (including those with and without background DMARDs) revealed 17.6% for AST/ALT elevations >1× ULN and 2.1% for >2× ULN. Among 6861 patients, 0.57% cases had abnormalities >3× ULN and 0.13% of cases had ALT and/or AST values >5× ULN. The number of patients with these degrees of elevation was not sufficient for further statistical analyses but they were evaluated on an individual case basis as discussed below. Table 4 and figures 1 and 2 show adjusted ORs and 95% CIs for the groups when AST/ALT values were >1× and >2× ULN, respectively. For LFT elevations >1× ULN (figure 1), the adjusted ORs comparing individual TNF-Is with all oral DMARDs ranged from 1.00 to 1.58 and achieved statistical significance for ADA and INF in those patients also using MTX or other DMARDs (model 1) and in prevalent TNF-I users (model 2). Among new TNF-I initiations (model 3), only the OR for AST/ALT elevations for INF was significantly different from the other DMARDs. Figure 2, which presents the ORs and CIs for AST/ALT abnormalities >2× ULN, shows fewer differences among the TNF-Is probably due to smaller numbers. However, INF treatment retained a higher likelihood of elevations in this range in models 1 and 2. Interestingly, in model 3 (new initiations), ADA and INF treatments were associated with a higher OR for elevation of transaminase enzymes than comparator DMARDs. ETN showed no difference from the comparison group for either >1× ULN AST/ALT elevations or >2× ULN AST/ALT abnormalities in any of the three cohorts. In the interaction models for elevations >1× ULN accounting for the concomitant use of MTX, the results were similar (table 4). In models 1 and 3 INF was still associated with an increased likelihood of elevation even in the absence of MTX (ORs 2.42 and 3.12, respectively). Interaction models for abnormalities >2× ULN were not done because the number of patients was too small. To assess for chanelling bias in the MTX alone reference group (ie, biological agent was discontinued due to previously elevated transaminase), we analysed 381 patients on MTX monotherapy. For those 127 patients who discontinued TNF-I during the period of CORRONA observation, none had elevated transaminses. Although we cannot evaluate the reason for discontinuation in the 254 patients who discontinued the biological agent before CORRONA enrolment, we are reassured by the 127 evaluated above. To ensure that there was no time-dependent component to calculated relative risks, survival estimates were performed for each medication group. Observation time was 13 months for ADA, 15 months for ETN and 16 months for INF. Kaplan–Meier analysis revealed transaminase-free survival in an identical pattern to previous models with hazard ratios of 1.0 for ETN, 1.32 for ADA and 1.73 for INF (figure 3). Kaplan–Meier survival estimates by medication group. ADA, adalimumab; ETN, etanercept; INF, infliximab. Sensitivity analyses assessing rates of persistence and discontinuation revealed that, in 187 of 1210 visits with LFT elevations >1× ULN (26.3%), the elevations persisted to the next visit. Furthermore, 2.4% of the 1210 had further increases to >2× ULN at the follow-up visit. When values >2× ULN occurred, 25/143 (29.8%) had persistent abnormalities >1× ULN at the next visit with 11.9% still >2× ULN. This percentage was nearly identical when evaluating values over the subsequent 6 months (data not shown). In per-patient analysis, 91 of 634 subjects (14.4%) had abnormalities over three visits in a row. Repeat AST/ALT measurements were normal in 41.9% and 51.5% of those with values >1× and >2× ULN, respectively; 41% of those with prior elevations had no follow-up testing available for analysis. The median time between initial liver test abnormality and follow-up laboratory testing was 3.7 months. Discontinuation rates of TNF-I in those with LFT elevations >1× ULN and abnormalities >2× ULN (3.8% and 2.3%, respectively) were similar to those without LFT elevations (2.8%). In comparison, rates of discontinuation of non-biological DMARDs was significantly higher for those with increased LFT values (4.6% at >1× ULN and 12.3% at >2× ULN) compared with those without LFT elevations (2.1%). In these analyses, conducted in a longitudinal database of cooperating private and academic practice rheumatology practices in the USA, the incidence of ALT and/or AST elevations/abnormalities with use of TNF-Is was uncommon and was significantly affected by use of background MTX and LEF treatment. However, after adjusting for these background medications as well as multiple other potential confounders, INF was most commonly associated with elevations/abnormalities of AST/ALT, ADA was less commonly associated and ETN was not associated with increased AST/ALT above the control DMARD groups. Most observed abnormalities (>1× or >2× ULN) did not appear to persist or result in changes in clinical management. The US Food and Drug Administration (FDA) recently issued a draft guidance document recommending assessments for potential drug-induced liver injury from therapeutic agents.24 Definitions included ‘mild hepatocellular injury’, defined as ALT/AST elevations >2× and <3× ULN.24 Although sensitive for detection of potential drug-induced liver injury, such values are not uncommon and, in isolation, rarely if ever result in liver failure.24 Our data included approximately 7000 patients and 14 000 patient-years of experience and identified only 39 instances of values >3× ULN and 9 that were >5× ULN. When detailed data on these 48 patients were reviewed, 5 were found to have non-medication-related causes including hepatitis B and/or hepatitis C (n=2), non-alcoholic fatty liver disease (n=1), alcoholic hepatitis (n=1) and metastatic disease (n=1) and 6 had insufficient follow-up data (single centre non-reporting). In the remaining 37 cases there were no instances of severe acute liver damage defined by abnormalities >5× ULN accompanied by elevated bilirubin (>2.0) and/or symptoms,24 25 nor were there liver-related hospitalisations or deaths. Although there is no definitive explanation for the observed differences in AST/ALT elevations between TNF-Is in our study, several possible mechanisms may be postulated. The differences in dose, dose schedule, route of administration or half-life of each agent as well as potential immunogenicity may contribute to these findings.8 19 20 Alternatively, Fc receptor-mediated clearance mechanisms could lead to local hepatocyte damage and transient release of liver enzymes. Hepatic sinusoids are recognised as a major location for clearance of immune complexes from erythrocytes27 and bind IgG immune complexes via Fc receptor-mediated interactions.28 These, in turn, can activate Kupffer cells to produce reactive oxygen metabolites.27 In vitro, monoclonal antibodies more readily form immune complexes than soluble receptors, potentially resulting in differential effects on hepatocyte activation.29 Lastly, a direct effect on hepatocytes cannot be excluded. Our analysis has some limitations. With the broad use of background DMARDs and a variety of concomitant medications typical of treatment of RA, it was not possible to clearly ascertain the contribution of polypharmacy or underlying hepatic disease to individual agents with absolute certainty, even with the regression and interaction analyses we employed to adjust for these confounders. Nevertheless, we believe there is no reason to posit an unequal contribution of potential confounders across the large number of individual anti-TNF agents described. In evaluation of the clinical impact of AST/ALT elevation we were unable to assess for dose adjustment of either TNF-I or non-biological DMARDs, thus missing potentially consequential dose reductions. In addition, we did not examine whether concomitant use of other non-rheumatological medications influenced our study results, but we would not expect an unequal distribution of such risk factors across the three TNF-I treatment groups. These limitations do not differ from previously reported studies of LFT abnormalities. It is likely that there were AST/ALT measures accrued that were not reported. The CORRONA registry collects laboratory data limited to within 1 week of each study visit on a quarterly basis, precluding analyses of values obtained between visits. This limitation resulted in missing some follow-up ALT/AST determinations (measured at a time removed from the actual clinic visit) in the persistency analysis. It would, however, be expected that interim laboratory values would be evenly distributed across interventions. It is also unclear to what extent previously labelled monitoring recommendations for either MTX23 or LEF22 may have influenced clinical practice. We believe that the unprecedented number of transaminase determinations included in our investigation (>22 500), in association with detailed data on simultaneous pharmacological interventions in a very large cohort receiving each of the TNF-I, has provided a unique and unprecedented opportunity to determine differences between these agents in real world use. 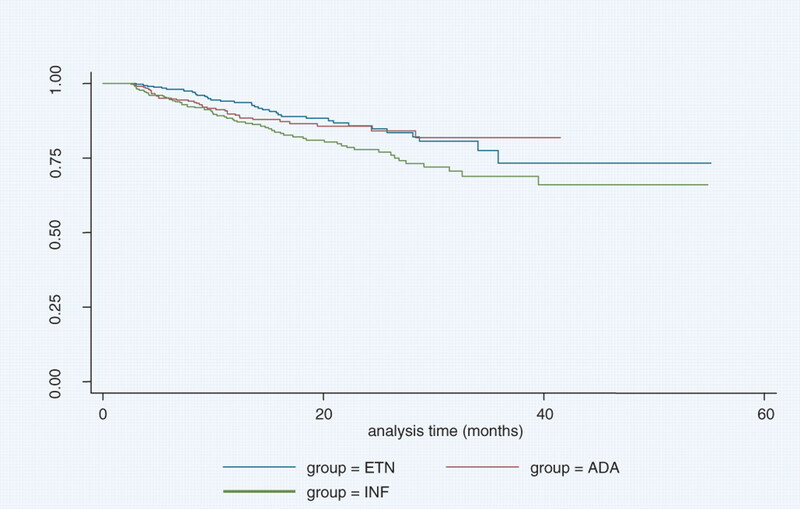 Across analytical models, INF was most consistently associated with LFT elevations into the abnormal range, ADA was less consistently associated and ETN was not associated with AST/ALT elevations compared with comparator DMARDs. Follow-up of individual cases of LFT elevations did not reveal clinically significant liver disease. These findings are clinically relevant and useful to clinicians following patients with RA on TNF-Is and other DMARDs because they can help decide on possible attribution of transaminase elevations to a particular TNF-I agent. The authors thank all their collaborators and colleagues participating in CORRONA.
. Significant changes in serum AST across hepatic histological biopsy grades: prospective analysis of 3 cohorts receiving methotrexate therapy for rheumatoid arthritis. J Rheumatol 1996;23:459–61.
. Determinants of serious liver disease among patients receiving low-dose methotrexate for rheumatoid arthritis. Arthritis Rheum 1993;36:329–35.
. Treatment of active rheumatoid arthritis with leflunomide compared with placebo and methotrexate. Leflunomide Rheumatoid Arthritis Investigators Group. Arch Intern Med 1999;159:2542–50.
. Leflunomide use during the first 33 months after food and drug administration approval: experience with a national cohort of 3,325 patients. Arthritis Rheum 2003;49:745–51.
. The efficacy and safety of leflunomide in patients with active rheumatoid arthritis: a five-year followup study. Arthritis Rheum 2003;48:1513–20.
. Hepatitis with interface inflammation and IgG, IgM, and IgA anti-double-stranded DNA antibodies following infliximab therapy: comment on the article by Charles etal Arthritis Rheum 2001;44:1966–8.
. Leflunomide for the treatment of rheumatoid arthritis in clinical practice: incidence and severity of hepatotoxicity. Drug Saf 2004;27:345–52.
. Summary of Product Characteristics (SPC). Centocor, Malvern, Pennsylvania, USA, April 2007.
. No increase in hepatic side effects or hospitalizations among RA patients using biologic treatment for rheumatoid arthritis. Ann Rheum Dis 2004;63:199.
. Infliximab single administration followed by acute liver injury. Inflamm Bowel Dis 2006;12:1089–91.
. Infliximab-associated reversible cholestatic liver disease. Mayo Clin Proc 2001;76:84–6.
. Occurrence of hepatoxicicty and elevated liver enzymes in a Crohn's disease patient treated with infliximab. Inflamm Bowel Dis 2007;13:1584–6.
. Serious liver disease induced by infliximab. Clin Rheumatol 2007;26:578–81.
. Granulomatous hepatitis associated with etanercept therapy. J Rheumatol 2008;35:349–51.
. Infliximab-induced hepatitis: absence of cross-toxicity with etanercept. Joint Bone Spine 2008;75:737–9.
. Elevated liver enzyme tests among patients with rheumatoid arthritis or psoriatic arthritis treated with methotrexate and/or leflunomide. Ann Rheum Dis 2010;69:43–7.
. Hepatotoxicity of salicylazosulfapyridine: a case report and review of the literature. Am J Gastroenterol 1979;72:561–4.
. Light and electron microscopic analysis of sequential liver biopsy samples from rheumatoid arthritis patients receiving long-term methotrexate therapy. Followup over long treatment intervals and correlation with clinical and laboratory variables. Arthritis Rheum 1995;38:1194–203. Enbrel package insert. Amgen Corp, Thousand Oaks, California, USA, December 2006. HUMIRA package insert. Abbott Laboratories, North Chicago, Illinois, USA, July 2007.
. The CORRONA database. Autoimmun Rev 2006;5:46–54. Arava package insert. Sanofi Aventis, LLC, Bridgewater, New Jersey, USA, July 2007.
. Methotrexate for rheumatoid arthritis. Suggested guidelines for monitoring liver toxicity. American College of Rheumatology. Arthritis Rheum 1994;37:316–28. US FDA. Guidelines for Industry-drug Induced Liver Injury: Premarketing Clinical Evaluation. http://www.fda.gov/downloads/Drugs/GuidanceComplianceRegulatoryInformation/Guidances/UCM174090.pdf (accessed 24 Oct 2007).
. Hepatotoxicity: the adverse effects of drugs and other chemicals on the liver. New York, USA: Appleton–Century-Crofts, 1978. FDA, Center for Drug Evaluation and Research, Arthritis Advisory Committee. Safety of TNF Inhibitors, 4 March 2003 (Transcript). http://www.fda.gov/ohrms/dockets/ac/03/transcripts/3930T1.htm (accessed 18 September 2007).
. Primate erythrocyte-immune complex-clearing mechanism. J Clin Invest 1983;71:236–47.
. IgG immune complex binding to and activation of liver cells. An in vitro study with IgG immune complexes, Kupffer cells, sinusoidal endothelial cells and hepatocytes. Int Arch Allergy Immunol 2000;121:329–36.
. Biologic therapies in rheumatology: lessons learned, future directions. Nat Rev Drug Discov 2007;6:75–92. Funding This work was funded by the Consortium of Rheumatology Researchers of North America. Competing interests Amgen, as part of its subscription of CORRONA, requested the analysis and were involved in the early design and manuscript review and comment for this study. The final analysis plan, the study results and interpretations of the study data were those of the non-Amgen authors. A professional medical writer was not employed. The manuscript was written by the first and senior authors with editorial input from all academic co-authors. Amgen employees were not involved in the writing of the manuscript. VS has worked as an independent biopharmaceutical consultant in clinical development and regulatory affairs since September 1991 for the following companies: Abbot Immunology, Alder, Allergan, Almirall, Amgen Corporation, AstraZeneca, Bexel, BiogenIdec, CanFite, Centocor, Chelsea, Crescendo, Cypress Biosciences, Eurodiagnostica, Fibrogen, Forest Laboratories, Genentech, Human Genome Sciences, Idera, Incyte, Jazz Pharmaceuticals, Lexicon Genetics, Logical Therapeutics, Lux Biosciences, Medimmune, Merck Serono, Novartis Pharmaceuticals, NovoNordisk, Nuon, Ono Pharmaceuticals, Pfizer, Procter and Gamble, Rigel, Roche, Sanofi-Aventis, Savient, Schering Plough, SKK, UCB, Wyeth and Xdx. She serves on the advisory boards for the following: Abbott, Amgen, BiogenIdec, BMS, CanFite, Centocor, Chelsea, Crescendo, Cypress, Eurodiagnostica, Fibrogen, Forest, Idera, Incyte, Jazz, Nicox, Novartis, Pfizer, Rigel, Roche, Savient, Schering Plough, UCB and Wyeth. JDG serves as a paid independent consultant in the function of Chief Scientific Officer for CORRONA for the current year. He also has served as a consultant on advisory boards to BMS, Centocor, Genentech, Roche and UCB. JRC is on the advisory boards and/or is a consultant for Roche, UCB, Procter and Gamble, Amgen, Centocor and CORRONA. He also has served as a speaker for Novartis, Procter and Gamble, Eli Lilly, Roche and Merck. His research grants are with Novartis, Amgen, Merck, Procter and Gamble, Eli Lilly, Roche, Centocor and CORRONA. AK has conducted research trials for Amgen, Abbott, Centocor and UCB. JMK has received grant support from Abbott, Amgen, BMS, Centocor, HGS, Genentech, Pfizer, Roche and UCB. He receives consulting fees from BMS, Centocor, Pfizer, Roche and UCB. GR has a research contract with CORRONA through the University of Massachusetts Medical School. LC has received consultant fees from Roche, Amgen and Genentech and as a speaker for Centocor, Genentech and Abbott. MH and SB are employed full time with Amgen and owns stock and stock options. DEF receives research grants from Abbott, Actelion, Amgen, BMS, Genentech, Gilead, GSK, Nitec, Novartis, Roche, UCB, Wyeth and Xoma. He is a consultant and serves on the advisory board of the following (honoraria where indicated): Abbott (honoraria), Actelion (honoraria), Amgen (honoraria), BMS (honoraria), BiogenIDec (honoraria), Centocor (honoraria), Genentech (honoraria), Gilead (honoraria), GSK, Merck (honoraria), Nitec (honoraria), Novartis, Roche, UCB, Wyeth and Xoma.